For years, she would feed us reasons why we should drink the soups she made. Eventually the justifications ceased, and we all stopped pouting as well. Nothing had changed, but it was as if a switch on our palates turned on. We started enjoying and craving her soups. Fast forward to present day, I now make her soups at home. When I told her that I make them for myself, I could tell she was very pleased that her tactic worked. To be honest, I never really believed the reasons she gave me (especially when I peaked at 5 feet at age 14), but I do enjoy the soothing taste of her soups. I was raised on clear broth soups, and this one is very comforting to me because it appeared on our dinner table at least once a week. This recipe was the first Chinese soup I ever attempted. I tried it for the first time in college, and I loved it because it was healthy, easy, and quick. There was no time for a 3 course meal as a busy student, but this recipe yields a soup and a main dish. Like most soup recipes, this one is extremely forgiving. 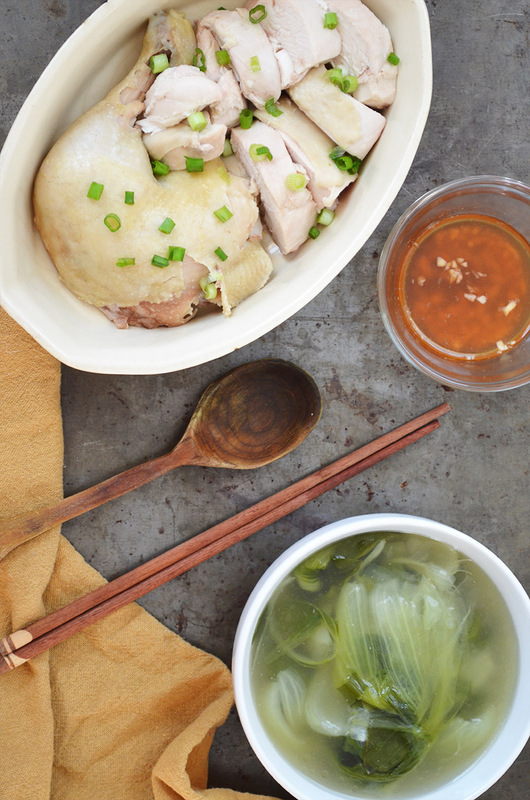 A whole chicken is used to make the soup, and after 40 minutes of simmering, the chicken is plated, sliced, and served with a delicious dipping sauce, and rice. Of course, ladle a bowl of soup to have on the side as well! It’s lucky that I made this soup over the weekend because I feel a cold coming on. I get to enjoy my day off resting in bed. Seems like my immune system likes to go on vacation during three day weekends too. Ok, that’s not fair to say since it is probably working overtime to fight this cold. In a large stock pot, boil 3 quarts of water. Place one piece of ginger inside the chicken's cavity. Add the salt, the rest of the ginger, and the chicken to the pot (breast side up). Let it simmer for 20 minutes, then turn the chicken upside down (breast side down) and simmer for another 20 minutes. Plate the chicken, then set aside. Add the fish sauce, sherry, bok choy, and green onions to the pot. Bring to a boil, then simmer for 1 minute. Remove from the heat and serve. When the chicken is cool enough to work with, slice and serve with the dipping sauce (recipe below), rice, and a bowl of soup with bok choy. Whisk together all the ingredients, then serve with the chicken. This entry was posted in Entrees, Soups and tagged bok choy, chicken, Chinese. MMM this looks so good! Pinned! I like how easy it is too ~ I’ll be trying this for sure. I’ve been eating mostly tofu and egg for protein these days because it’s fast, so this will be a welcome change (which the Spork will be very thankful for too!). Such a simple soup for an easy meal option. Perfect to those busy week days! Love it. This sounds so good especially for these cold winter nights! I’m excited to try this! Hope you’re feeling better! i love the story about your mother and eating soup each night. This soup sounds amazing and definitely something is want to eat on a cold winter night like tonight. Hi Connie! I love that this is so simple but I know it is juicy and the dipping sauce adds flavour! Could you please clarify if you serve the broth on the side?? 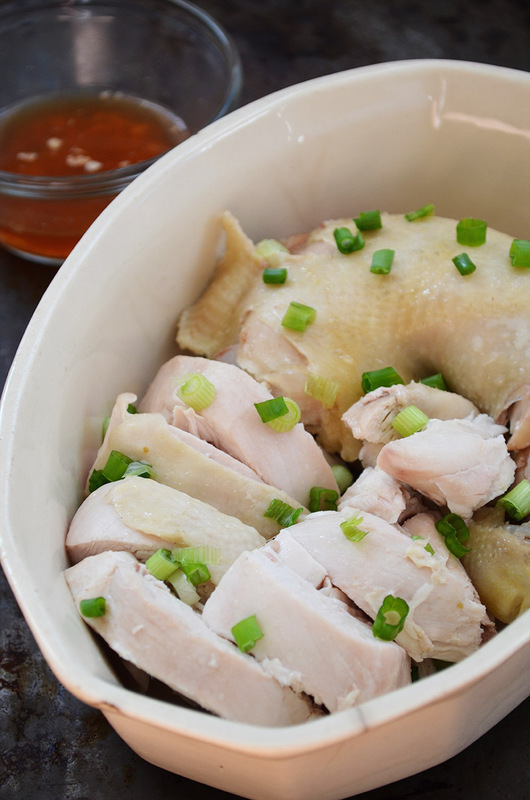 Or do you use it for the rice, like Hainanese chicken?? Hi Nagi! 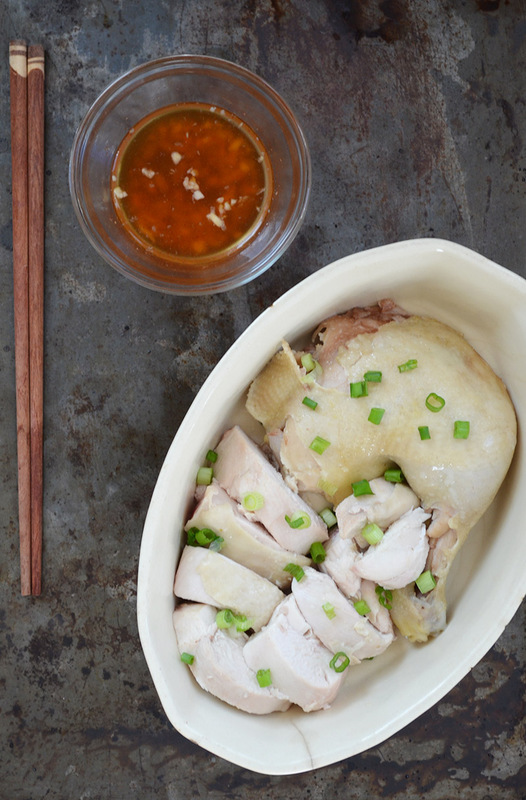 Thanks for asking – I serve the broth on the side (: I *love* Hainanese chicken, and this recipe is so similar to it. Your comment has inspired me to make it soon! Thank you Kawami! You are soooo sweet! This is my first time in your blog. 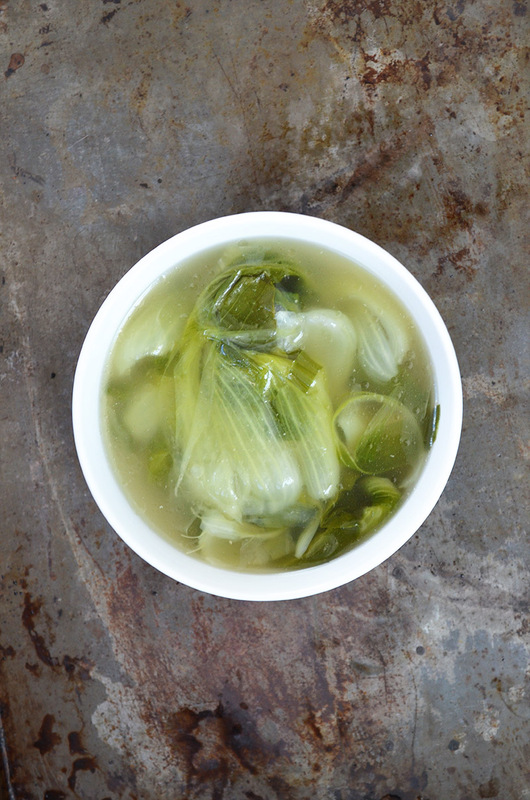 With vibrant bok choy in the garden I thought I would give this recipe a try,.The broth just looked so easy and I was surprised and very pleased by it’s mild but full flavor. A great recipe for taste and also ease of cooking…..